Deep in the woods lies a dried lake. For years, this lake has created a border between the four kingdoms that lie and depend on it. Now, it has dried up, and the area is up for grabs! That would be the story, summed up in a few words, but it isn't really that important. Anyway, the history behind this game is that I planned on creating a single player game on a 30x30 map that would depend on stealth and placing your units in the best possible place. Later, I figured that it would be easier just to have it be a multiplayer game, and thus, I expanded the map to 4 times its initial size. That might explain why the map is so pretty (compared to Grass1 and trees). The installation and settings can be found in the README, included with the zip folder. This is the final version. Not any earlier, beta versions some people may be carrying. - And anyone else who tested the game during MCSN. These names just came to my mind first. Please email me for any feedback (which can be found in my profile). Mapppp's quotation used as a tagline is a perfect summary of this game: "like Hide and Seek on steroids". After starting out the game becomes a hugely competitive and tactical war: do you attack now and risk losing your starting units, or do you press home and possibly gain an advantage? A certain diplomacy can come into effect even on unlocked teams: do you offer to save one player until last for mutual advantage? The game's simplicity is its joy. Only four units in the game, pikemen, archers and a buffed robin hood. This makes micromanagement important and also causes the gameplay to be very easy to grasp. Promises and delivers. A tense and fast-paced battle-royale, culminating in the loss of ones king. Only in blood format. All players start off with, and are given equal units. The only possible problem is if one player chooses vikings, japanese or britons as a civ, as these give unfair bonus. A simple solution is banning them. Borrows elements from a CBA game and regicide, while showing nothing 'new' essentially it has been flawlessly constructed and presented. The novel idea of researching spies at a timer both shortens the game time and ensures this scenario scores highly here. The map gives a small advantage to players 1 and 2, instead of positioning one player at each corner players 3 and 4 "share" the left side. While I can appreciate the need for the units in the right corner (therefore preserving the balance score) this does rather detract in terms of asthetics. 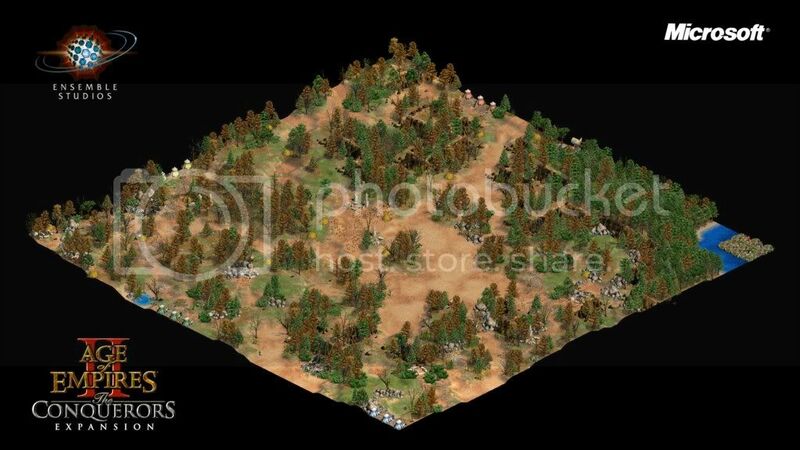 Regardless, the quality of the forest is high with use of dead farms, rocks and ruins to raise the level above that of a random map. the scenario instructions and hints sections are a little flippant. A fine multiplayer game, its short length ensures no game feels frustrating and the fast-paced play makes it ideal micromanagement practice for those who prefer archer civs.